For the oil and gas industry, former buildings, facilities, well pads and rigs often hold promise of a second life for both local communities and the environment, whether it’s turning an offshore rig into an artificial reef, reclaiming an onshore drill site or repurposing a building or port to fit a variety of socially beneficial needs. All are examples of industry’s commitment to being a responsible neighbor on land and in the sea. Anadarko’s Red Hawk facility is part of a program known as Rigs to Reefs. 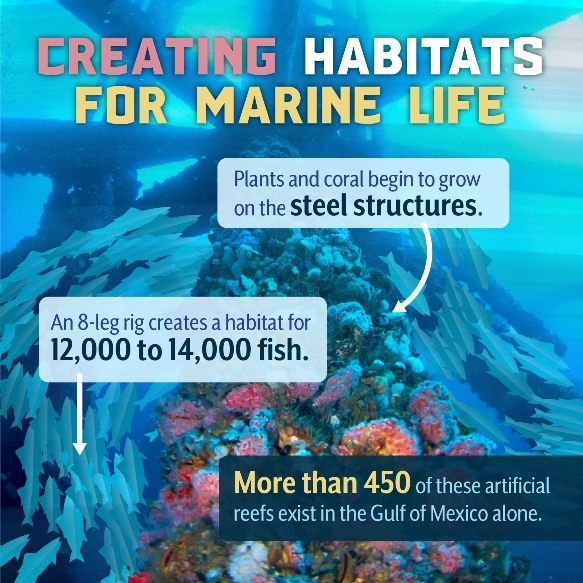 Under the program, more than 450 platforms have been converted into permanent artificial reefs, providing homes for millions of fish and other marine life. According to a study by the Coastal Marine Institute, a converted eight-leg rig can be a home for 12,000 to 14,000 fish. Likewise, a four-leg rig provides 2 to 3 acres of marine habitat. Meanwhile, a study from the University of California-Santa Barbara found that completely removing offshore rigs can be detrimental for some heavily fished species, as many have adopted the rig and the safety it offers as a home. Among the leaders in the pack for turning decommissioned offshore rigs into artificial reefs is Chevron. Since 1983, the company has donated 74 structures to Rigs to Reefs programs in states along the Gulf of Mexico, including Louisiana and Mississippi. Each of these new reefs creates an ecosystem that can become home to thousands of invertebrates (like shrimp) as well as fish. 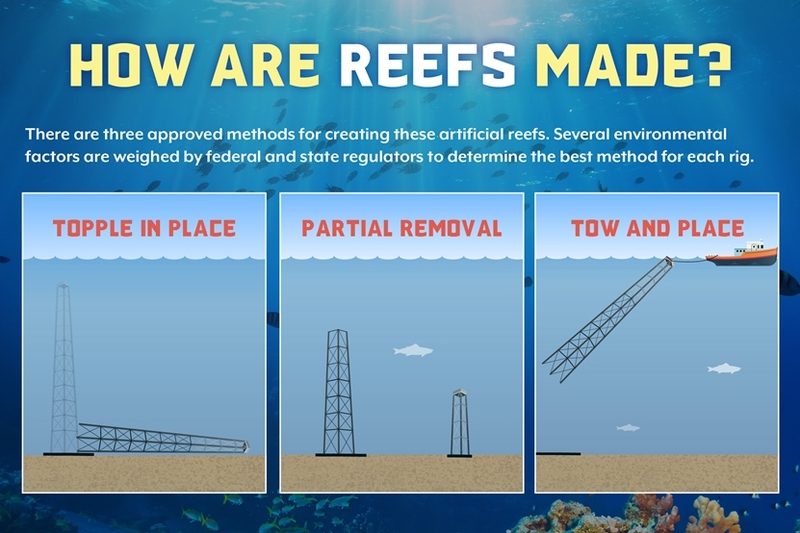 While the conversion of rigs into artificial reefs literally takes the structure beneath the surface, the industry is also active in repurposing its more visible land-based properties and facilities. This provides economic benefits for local communities and helps give a new purpose to places that might otherwise sit underutilized. At BP, this includes working with state and local leaders in New Jersey in redeveloping the company’s former terminal at the Port of Paulsboro. To do this, BP worked with local governments to transform the site, which it purchased in 1969, from a brownfield into a commercial port, bringing much-needed jobs and revenue into the area. In addition to providing early funding for project planning and feasibility studies, BP entered into a 99-year agreement to lease the property to the Borough of Paulsboro for $1 a year. In 2014, the Port of Paulsboro began welcoming its first commercial tenants. Aware of the need for a strong remediation, reclamation and asset retirement program, Chevron established the Chevron Environmental Management Co. (EMC) in 1998. One example of the EMC’s work is the redevelopment of a piece of property at the company’s former Louisville, Ky., lubricants plant. The EMC provided oversight in the project, protecting public health and ensuring the use of solar-powered technologies in the remediation work, which turned the property into a student parking lot for the University of Louisville. Like Rigs to Reefs, the industry also is active in restoring sustainable natural habitats on land-based properties. These programs strive to take sites that formerly served as energy production facilities and completing reclamation efforts so they can more fully benefit local ecosystems and wildlife. At Devon Energy, reclamation efforts are ongoing at several sites across North America. In Wyoming, the company facilitates annual habitat reclamation projects with the Wyoming Conservation Corps. In New Mexico’s Permian Basin, Devon works on habitat reclamation and enhancement programs, which have included protecting endangered wildlife like the dunes sagebrush lizard. In Harris County, Texas, ExxonMobil saw an opportunity for a former drill site to serve as a buffer for an inland waterfowl rookery. The company donated the 5 acres of land adjacent to the rookery for stewardship by the Armand Bayou Nature Center. This donation helps to protect an area that serves as a sheltered breeding spot for herons, egrets, spoonbills and other species of coastal water birds. For more than 15 years, Glenn Springs Holding, Inc. has been working to clean up the Copper River Basin in southeastern Tennessee. Glenn Springs, a wholly owned subsidiary of Occidental Petroleum, manages remediation programs for the company. The Copper River Basin, one of its largest projects, is the site of a former copper and sulfur mine, in addition to many other industrial activities. In 2001, Glenn Springs reached an agreement with the U.S. Environmental Protection Agency and the Tennessee Department of Environment and Conservation. Together, they are working to clean up the site and restore its natural beauty and environment for future visitors. Bracken said if there is an excess of wellbore material, the company has land where the material can be applied. The company plants barley or other crops that produce straw, which can be used to hold moisture when well pads are being reclaimed.